The Brijuni Islands or Brijuni archipelago are today one of the most attractive tourist destinations in Croatia. This archipelago consists of a group of islands off the western coast of Istria, which together with the surrounding waters was proclaimed a national park in 1983. 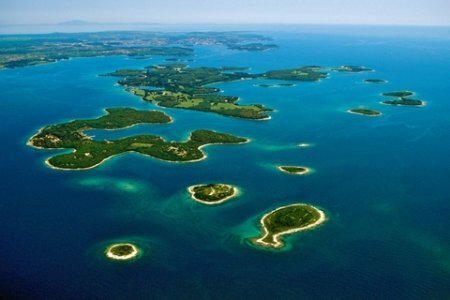 The islands are only 6 km from Pula and separated from the mainland by Fažana Channel, with a regular daily boat service from the nearby Fažana port. The Brijuni Islands comprise two larger islands – Veliki and Mali Brijun, as well as 12 smaller and exceptionally indented islands that have been inhabited since prehistoric times. Brijuni are well known for their mild Mediterranean climate with plenty of sun and humidity, which is ideal for the lush vegetation and pleasant stay on the islands. In winter, the average air temperature is 5.9o, in spring 12.2o, in summer 23.2o, and in autumn 14.8o Celsius. In summer the sea temperature is between 22o and 25o, whereas the air temperature is about 23o Celsius. The vegetation on the Brijuni is extremely luxuriant and the national park area is full of tropical plants that form specially maintained tree-lined lanes, parks and gardens. Brijuni are the ideal choice for guests seeking accommodation of the highest category and the best offer of additional facilities.